The Malaysian state of Johor is at the southernmost end of the Malay Peninsula, where the Straits of Johor form the border between Malaysia and Singapore. Johor Bahru is the capital of the state, and it’s where the first and busiest border crossing to Singapore is. For years JB languished in the shadow of its prosperous neighbour, and it had a seedy bordertown reputation. Now it’s waking up to its geographical potential as being a cheaper alternative to Singapore, and new developments are transforming the city and surrounds. The southern portion of the state has been designated as a special economic region known as Iskandar Malaysia. 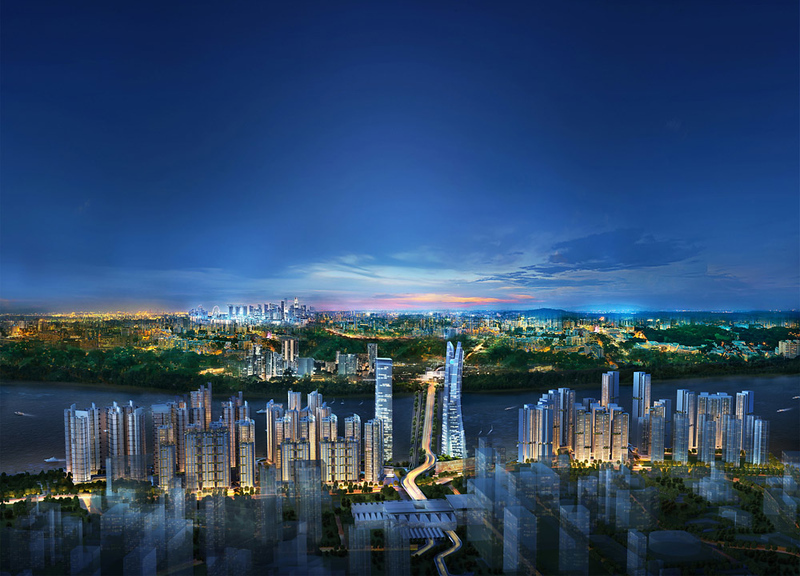 This was formerly known as Iskandar Development Region (IDR) and South Johor Economic Region (SJER), and the region has been likened to Shenzhen. This post features various current and proposed buildings, new cities, and transport projects in Johor Bahru and around Iskandar Malaysia. Feel free to send more suggestions and I will add them. 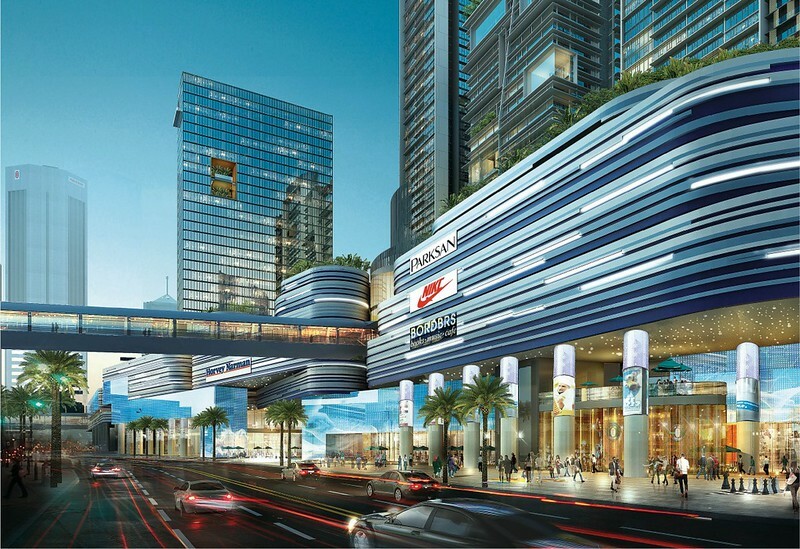 Starting in the centre of Johor Bahru is the Ibrahim International Business District (IIBD). The IIBD covers the area between JB Sentral Station and the botanical gardens, so it’s basically the entire inner city core. I visited in September 2018 and you could see that central JB was in the midst of transformation. There are new malls and apartment towers, and tired old concrete blocks were being knocked down to make way for more projects. The centrepiece of the proposed business district will be Coronation Square, which will include an office tower, serviced apartments, a hotel, medical suite, and a podium-level mall. The main tower is planned to be 370 metres tall. Driving across the Causeway Bridge from Singapore the first thing you’ll see is R&F Princess Cove. 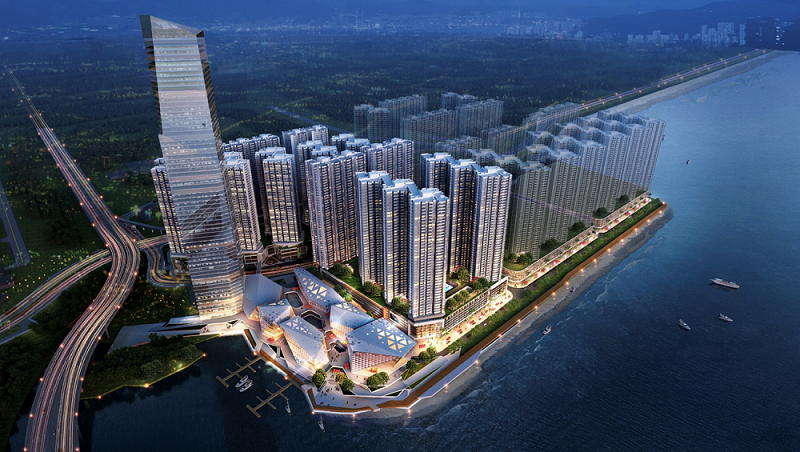 This development features a dense cluster of apartment blocks that overlooks the Strait, and a separate office tower and hotel will flank the bridge as a gateway to the city. There will also be an opera house next to the bridge, which is reminiscent in style and position to the Sydney Opera House. R&F Princess Cove is near the Johor Bahru Customs, Immigration, and Quarantine Complex (CIQ), and a pedestrian bridge has been built to connect the apartments to JB Sentral/CIQ. 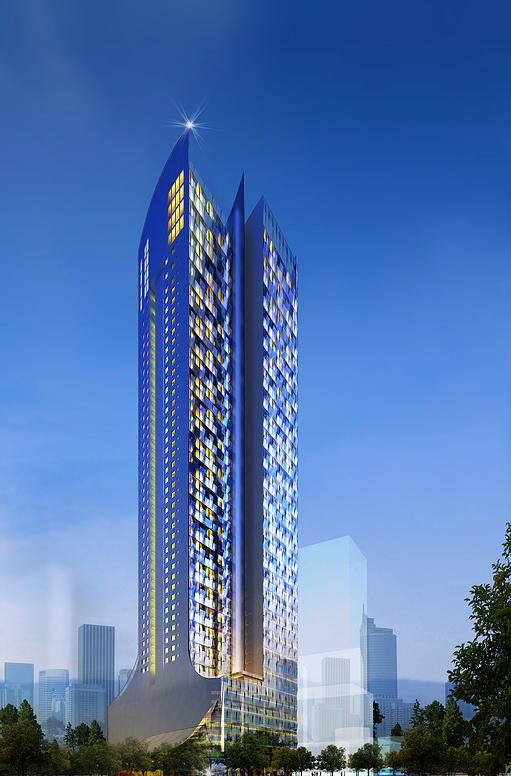 Phase one of The Astaka has been completed and the two 70 and 65 floor towers have become landmarks of the city. At 278.8 metres, it became the tallest residential tower in Southeast Asia. 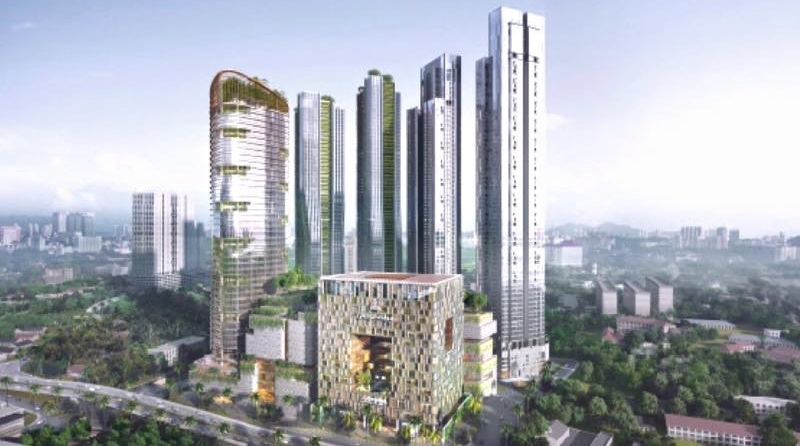 Phase 2 will include the new headquarters of the Johor Bahru City Council, serviced apartments, a five-star hotel, and a shopping mall. 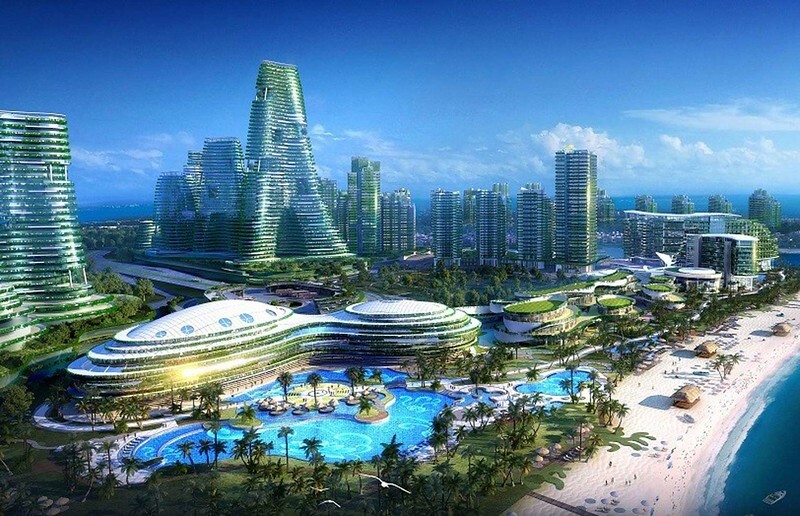 Also on the Johore Strait is a plan to reclaim land near the current Berjaya Hotel site. The proposed feature tower looks to be inspired by the Marina Bay Sands in Singapore. This development area is where the Sungai River meets the Johore Strait. 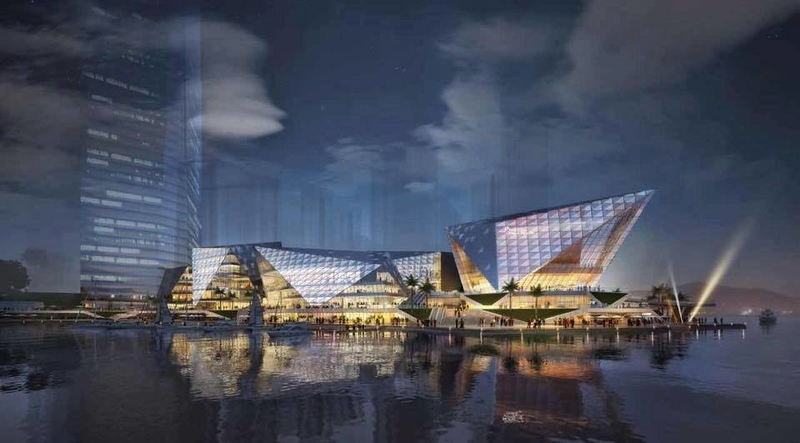 There are several developments happening along the waterfront that would turn this into another business district within JB. 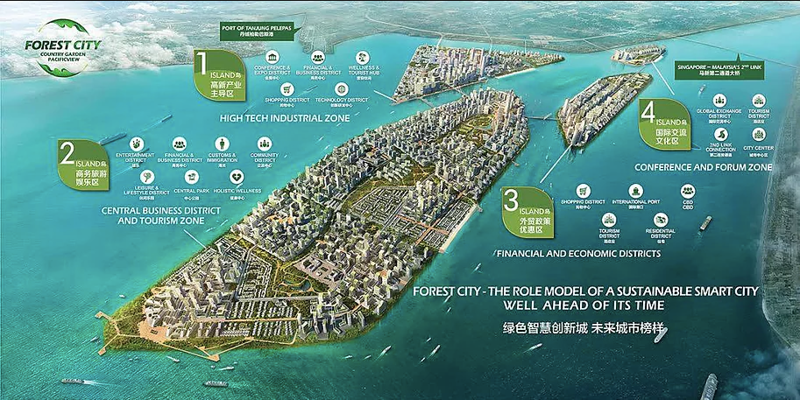 The biggest (and most controversial) development in all of Johor is the Forest City project. 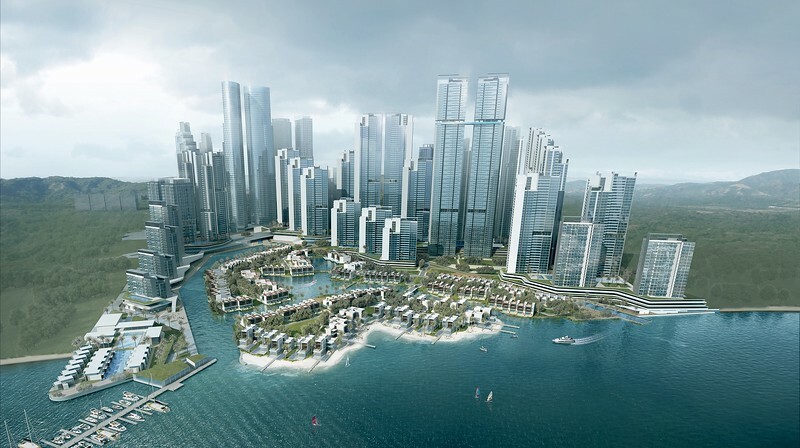 Forest City consists of four man-made islands west of Johor Bahru, near the Singapore Second Link. It’s expected to eventually be home to 700,000 people. The US$100 billion project has been controversial due to the amount of foreigners buying property, with “planeloads of Chinese buyers” flying in to buy. Malaysian Prime Minister Mahathir said that Malaysia will not allow foreigners to buy residential units, which threw doubt and confusion onto the development. One of the main concerns was that investors were buying residential visas to live in Malaysia, which is not the case. 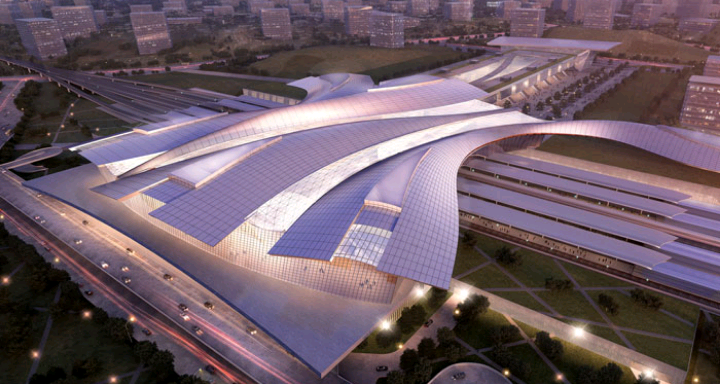 The Kuala Lumpur to Singapore High Speed Rail (HSR) is a proposed new railway completely separate from the current line. 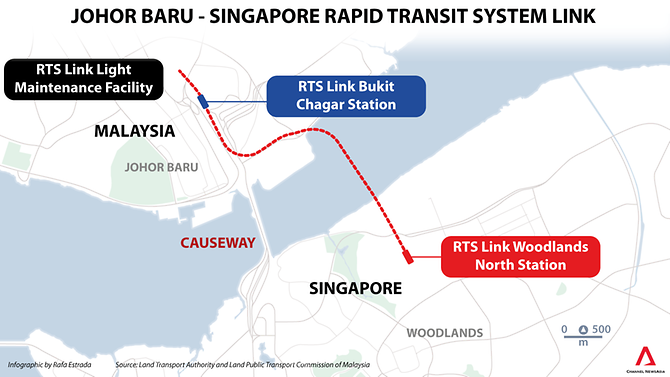 The HSR would serve seven stations in Malaysia and Jurong East in Singapore, with an end-to-end travel time of 90 minutes. 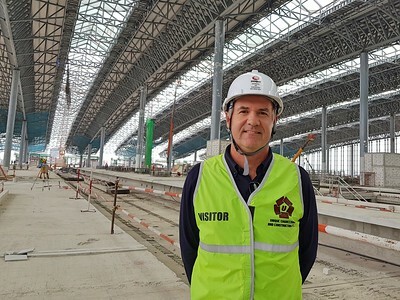 Iskandar Puteri Station in Gerbang Nusajaya will be the border station of Malaysia. The co-located Customs, Immigration and Quarantine (CIQ) facilities will be located there. International-bound passengers will go through CIQ clearance by both countries’ authorities only at the point of departure. This project was on the verge of getting started in 2018, but the new Malaysian government has asked Singapore to defer the project until 2022 due to the high cost. If/when this project does go ahead it will move the centre of gravity from Johor Bahru to the Second Link area. Johor Bahru has become a virtual suburb of Singapore, with cheaper cost of living being an incentive for thousands to make the daily commute across the strait. 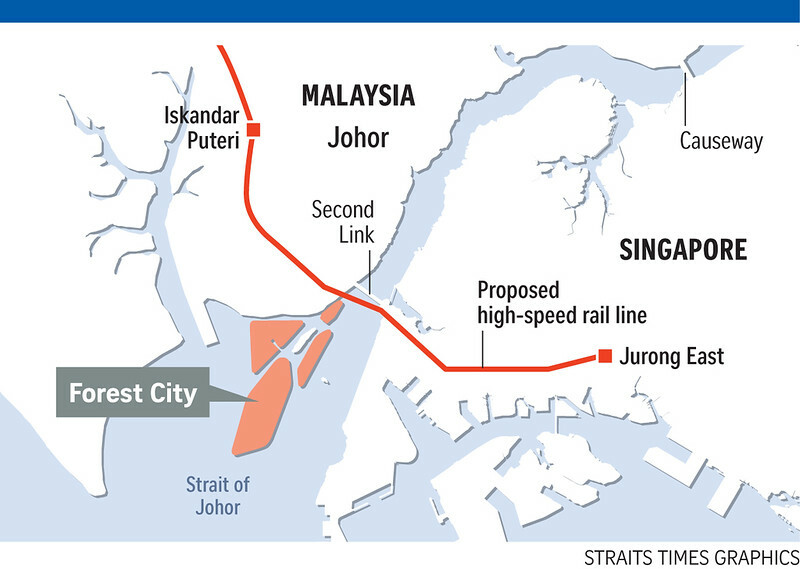 To help ease congestion on the Causeway a metro railway is planned to connect JB to Singapore. The train will run from Bukit Chagar to Woodlands North, and passengers will clear Malaysia and Singapore immigration at the point of departure. Woodlands North Station will be connected to the future Thomson-East Coast MRT Line. The project is expected to be completed by 2024, and it is likely that more apartment projects will be built around Bukit Chagar for commuters who want a speedy departure to Singapore. 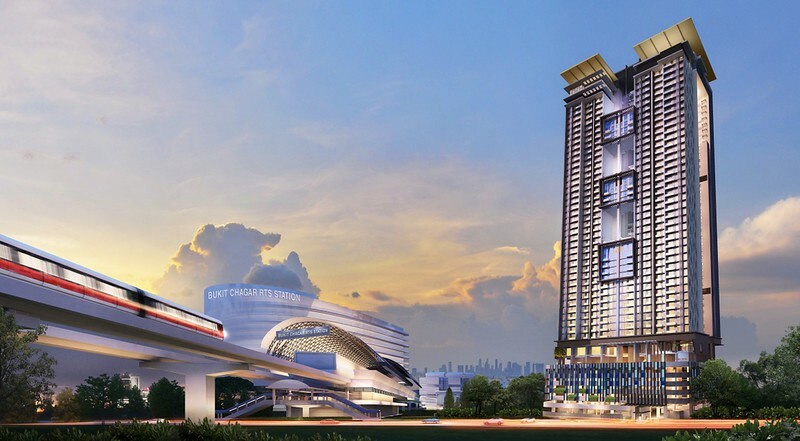 For example the proposed 50 storey Twin Tower Residence by MB Group depicts what the Bukit Chagar RTS station might look like. 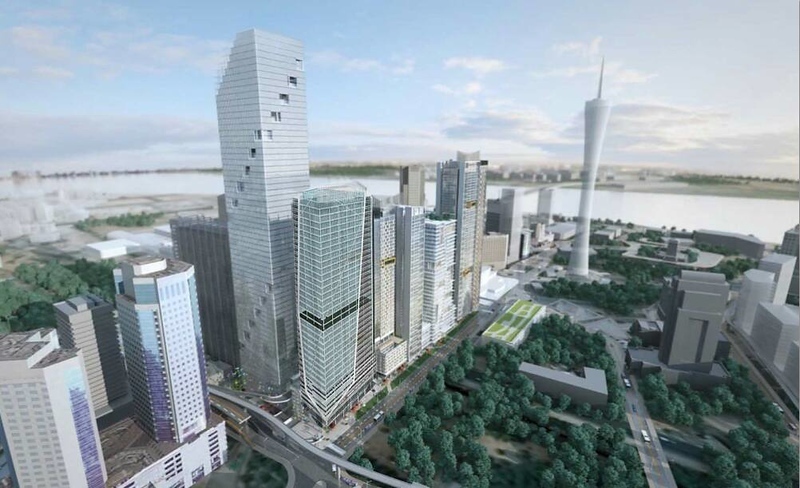 A proposed 239m and 100m+ tower project in Johor Bahru. No further information. 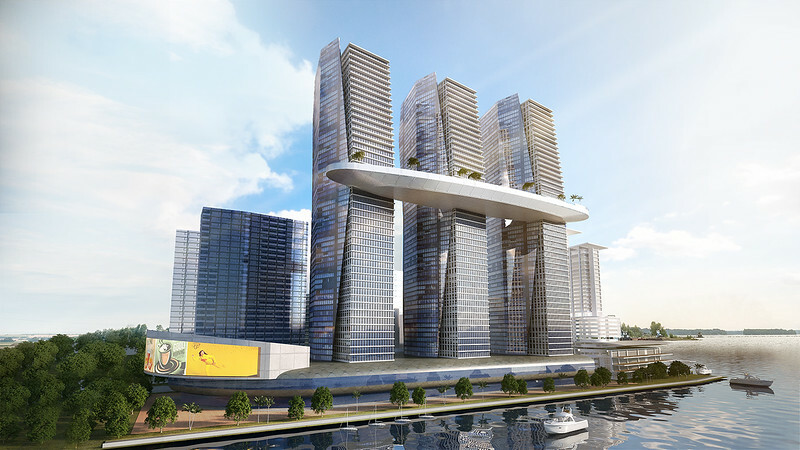 Hao Yuan Tower was a proposed super-tall tower at Danga Bay, west of the JB central city area. It was initially proposed as being the tallest building in Malaysia before settling at 405.5 metres. Since then the project has gone quiet, so this may eventually be filed as a “never built”. I’ve not found any images for it, so if you know of one send it over.